The prime minister took a bath at Triveni Sangam in Prayagraj and also interacted with sanitation employees. Prime Minister Narendra Modi visited the ongoing Kumbh Mela in Prayagraj on Sunday at Kumbh. He took a holy dip and performed a special puja at Triveni Sangam. He also participated in the Swachh Kumbh Swachh Aabhaar event, organised by the Ministry of Drinking Water and Sanitation. 05:25 pm: “The amount collected after auctioning the presents that I received in the past 4.5 years as the Prime Minister are being used in the service of Maa Ganga”, Modi said. 05:20 pm: PM Modi said that serving poor and deprived is real humanity. 05:15 pm: He said thet Kumbh Mela 2019 has given a very strong definition of cleanliness. 05:05 pm: “I really appreciate the hard work and contribution of the sanitary workers who were continuously involved in keeping the place clean even being not in notice,” PM Modi said. 05:03 pm: He congratulated all the sanitary workers for keeping the mela clean throughout which was really a tough task to be done. 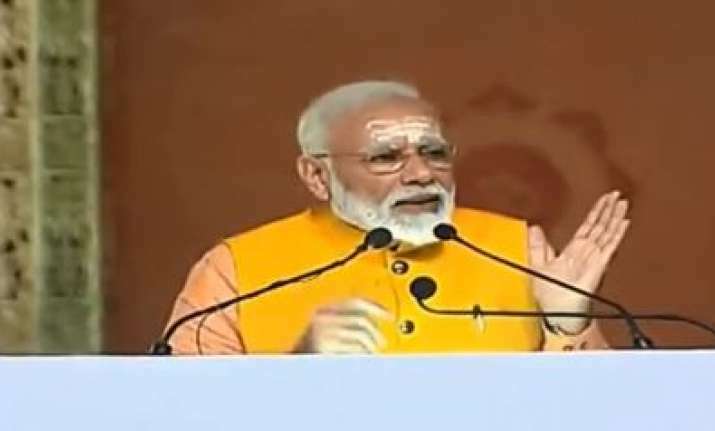 05:00 pm: PM addresses gathering under ‘Swachh Kumbh, Swachh Aabhaar’ at Kumbh Mela, Prayagraj. “There will also be the digital announcement of Swachh Seva Samman Benefits package,” said the statement issued by Prime Minister’s Office. Modi interacted with sanitation employees and washed their feet as a part of ritual at Prayagraj. “Cleanliness and Swacch Bharat initiatives were given unprecedented focus in Kumbh organized at Prayagraj this year. The Prime Minister by presenting the Swachh Kumbh Swachh Aabhar awards will honour those who have played a vital role in ensuring a Swachh Kumbh,” the statement said. PM Modi also donated his Seoul Peace prize money worth Rs 1.3 crore to Namami Gange fund. The Kumbh Mela draws tens of millions of pilgrims over the course of approximately 48 days to bathe at the sacred confluence of the Ganga, the Yamuna, and the mythical Saraswati river. This entry was posted in Kumbh and tagged Kumbh, narendramodi.